Unemployment is at its lowest point in Wisconsin since February 2018 at 2.9 percent. It’s even lower in Waukesha County at 2.4 percent. That’s great for the economy, but tough on employers. Unemployment is at its lowest point in Wisconsin since February 2018 at 2.9 percent. It’s even lower in Waukesha County at 2.4 percent. 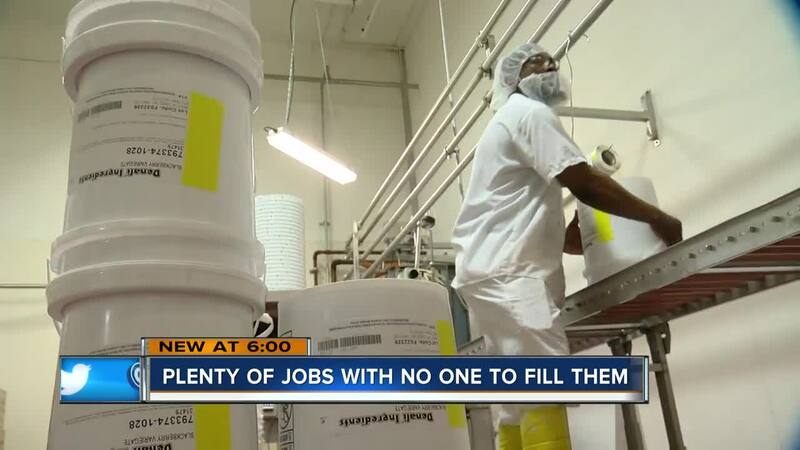 That’s great for the economy, but tough on employers as they try to hire workers. Almost on a weekly basis Neal Glaeser’s team is looking at resumes. Glaeser is the president of Denali Ingredients in New Berlin. “We’re always in need of people," said Glaeser. "We probably have needs for eight to 10 different folks right now." As the company grows, Glaeser is having a harder time filling positions. “We work a lot of overtime so if we were able to hire all the people we need to, probably be less of that,” he said. The problem isn’t unique to Denali Ingredients. According to Suzanne Kelley with the Waukesha County Business Alliance, 67 percent of businesses surveyed in Waukesha County say their number one concern is finding workers. “Waukesha County is booming, and as our businesses continue to thrive we know the labor shortage is going to get more and more dire,” Kelley said. There's also a transportation problem. Even if a person were to take multiple buses from Milwaukee to Waukesha County it could take three hours. So businesses are looking for creative ways to help including partnering with nearby businesses. “Workers across those businesses can carpool or ride share," said Kelley. "We have companies that are helping employees purchase vehicles or help with car repairs." But it's more than transportation. The cost of housing in Waukesha County is also a barrier, one the county is looking to solve by coming together to ask one question. "What can we do together to perhaps bring down the cost of housing in Waukesha County, so that more workers and young families can move here?” Kelley said. And as Waukesha County continues to grow with new hotels and other business ventures, expect to see even more job openings, including at Denali as it expands. To apply at Denali, click here.